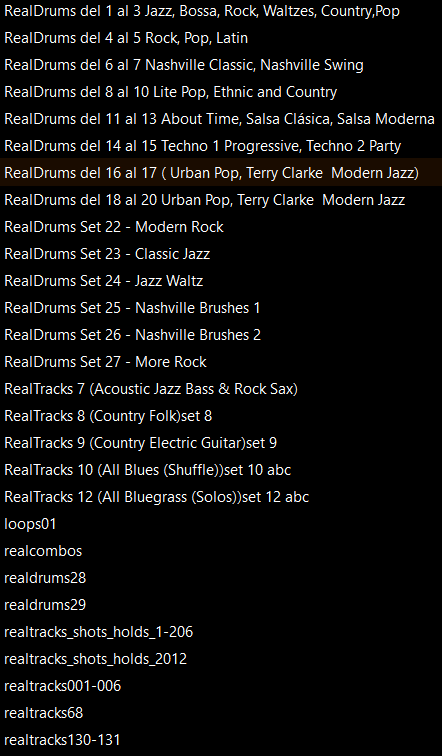 This is the list of RealTracks I use in the backing tracks. You’re only required to have some. Evan – mystery solved. Apparently the zip file was indeed opened. It created a folder with all the .SGU files and cleverly tucked it away behind another folder on my desktop, So, all is well! Now i go play. Thanks for your responsiveness and willingness to help – a true example of top notch customer service. If you have a boss, show him this; you deserve the kudos! can open the .txt file OK. But, if I try to open the .rar file, it just creates another .zip file. If I try to open the .zip file, it creates another .rar file. So much fun! Now, I should explain: all this is taking place on my iMac. Like many music officianados, I have a small (Acer) PC that I use just for music and this one has Band-in-a-Box 12 installed – yes, I know it’s old but it works great (thus far). So, I transfer the downloaded files listed above on a thumb drive and open up BiaB. When I go to “open file” on the drop down menu and work my way over to the thumb drive BiaB cannot see any files I’ve stored on the thumb drive. Sorry this so convoluted but I’m stuck here and looking for your help. file rar, (open with https://itunes.apple.com/us/app/rar-extractor-free/id646295438?mt=12 ), you get the folder with oll the files sgu. But, I saw your videos….please link to me which one explain about coda and so on. I’m sorry, perhaps I was unclear. In the video there are not the details you need. There is just enough to get started and create complete backing tracks in the easiest way possible on your own. Do you have already checked into my tutorial? Then you should be able to better understand the bulk of the BIAB manual, or search the web for any extra information you need (functions that I do not consider it necessary to use as live guitarist, to which my site addresses). I got B.I B 2016 realtrack…but, I could not reach and activated. Please how can I do to activate real tracks?. The real tracks don’t require activation, but If you have any problem with your BiaB 2016 then you should contact their assistance. For all your info about “Code”… etc., I’m telling you now that I do not use them as I try not to complicate my life. All you need to achieve a simple backing track is in my tutorial, watch it, and should you need clarification write back to me again. I like what you are doing, and it may help my band with backing, but I have a question. Can you get minilyrics to scroll over the top of BIAB – ie use BIAB as the media player? If so this would be brilliant. Getting lyrics and chords into BIAB has wasted a lot of my time. BIAB is not made to be a player with lyrics attached. I don’t think that is possible to do, Minilyrics is only compatible with a few players. SCAM ALERT!!!! I believe this site is a scam operation. I paid my $25 for a download of the 600 SGU files advertised on the Full Download page. Made my payment… no dowload link. Received a “PayPal” receipt even though I used a credit card… with the name of the recipient of my payment as Ivan Grisencho (icgriscenko@gmail.com). The receipt also has no download link. I’ve emailed Ivan directly since there’s no way to contact these folks on this web site. No answer. Hang onto your money people. Sorry for the delay, but yesterday was Saturday. Name and email on the receipt are correct. Usually there would be a link by PayPal after the payment. Regardless here is your link. Sorry for the inconvenience. Giancarlo there is no attachment to the email you sent, and the RAR file is only text, not a link. OK, Giancarlo, I figured out how to get the files. What you’re using is a link into your Google Drive account. I don’t use Drive very often (I use Dropbox) so didn’t know there was a download icon. Sorry for worrying that this was a scam. So many of those going around now. Thanks for the followup. Should you need some help, let me know. Click the Download button and immediately receive the rar folder containing the files). Hi. I am new to Band in BOx. Just bought the 2016, but I need more guitar users tracks to play with. Before I buy, I have a few questions for you. Will your guitar user tracks follow the chord changes in Band in a Box when I hit play-regenerate? Do you have link of video tutorial examples of how to use your user tracks in BIAB? I want to how to apply your users tracks and make it to follow the chord changes in the biab. 1. Yes of course, but it’s better not to use all the instrumental tracks simultaneously, leave some of them mute. 2. 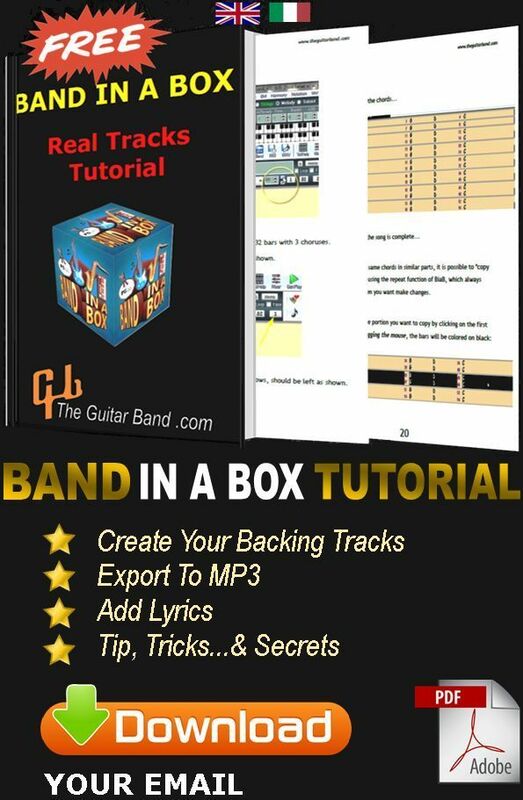 If you follow the website tutorials (https://www.theguitarband.com/tutorials/biab-tutorial/) you should have no problems utilizing the user tracks. Click on the first bar of the chorus and drag the mouse to select the area. The bars change into black. Thank you so much for this tutorials! Greatly appreciated, for sharing these pdf tutorials. hey I have a good question, how would you create a stop or rest, where the instruments would stop and maybe have a drum roll to bring them back in? To create a stop, type a chord followed by dots (1,2 or 3, check the result). It is a good idea to precede the stop by a fill (blue square). i want to ask for a help. i need a style like GNR knockin on heavens door. actually guitar riffs and drum style.. I do not know which track is closest to this song. Usually, I try various RealTracks and choose what I think is most appropriate, but it is almost never the exact copy as the original. Indeed, BIAB is not a program that can perfectly duplicate the instruments of the original song. Creations will always be a little different, but I think this is a virtue, not a defect. I turn the question to others who will perhaps be able to provide better answers than me. i got it.. i am doing that but i could not find the power chord style played by slash… i am really in need of it. I’m providing an indication hoping that it will be of help to others. I agree with Giancarlo. When i am doing a well known song, i try to make it a little “bit mine”.´Changing tempo or style. It is just a puzzle and sometimes you hit the right spot. Is there a simple way to delete bars 58,60,62 and 64 ? Select the bars (see page 22 of the PDF tutorial), right click, Cut. I have bought all of your things on your website, and i am very impressed. This i have been waiting for. Now i have a lot more to learn. Your BIAB tutorial is very easy to understand, but i have one question, and i send you a photo of what i mean. The example for Knockin’ On Heaven’s Door . How do you get 4 bars, and then just 2 bars from 57 to 64 and then back to 4 bars again? I have tried a lot of things, but failed. Has it something to do with “part markers”? If you have the time to explain this i would be very greatful. In this case you’re carrying 2 bars down the next line (the original 4 bars are split in two parts). I hope that you are comfortable in Spain (I have played in various clubs in Tenerife for a few years). Thank you for the quick answer! Impressed! Now i got it, and also my brain! Your tutorial is too fast to understand, it flies through like it had to get somewhere. Hi, what is the difference between BiaB and Real Band? RealBand is a program with many features, that combines PowerTracks, Pro Audio and Band-in-a-Box programs into an all-in-one sequencing program with automatic accompaniment. Mainly a digital mixer recorder/studio where you can record also your own track and produce your complete song. At the moment I don’t use Real Band. Only BiaB with Real tracks. I have band in ox box 2012 would like to get and would really like to get the tutorial of of how create backing tracks 1 and 2 so I can have then on hand when I’m not around the internet if I could get these downloaded to my site it would really help. Thanks for the request. I added the download link at the beginning of the page. i was very excited to find your site dealing with performing live with BIAB/Realband. I recently purchased the BIAB package in the hopes of creating backing tracks for performing solo. I play keyboard and do vocals. I have been recording at home for the past several years but have the urge to perform in public again.